CRM Performance toolkit (available for download in http://crmperftoolkit.codeplex.com/) provides an easy and comprehensive way to test various performance aspects of your CRM implementation. Here, I will brief on how you can use CRM Performance toolkit along with NetMon and VRTA to measure the bandwidth utilization during a test run of your performance scenarios. 1. Download NetMon from http://www.microsoft.com/downloads/details.aspx?FamilyID=983b941d-06cb-4658-b7f6-3088333d062f&displaylang=en and install in the machine where you have installed CRM Performance toolkit. 2. 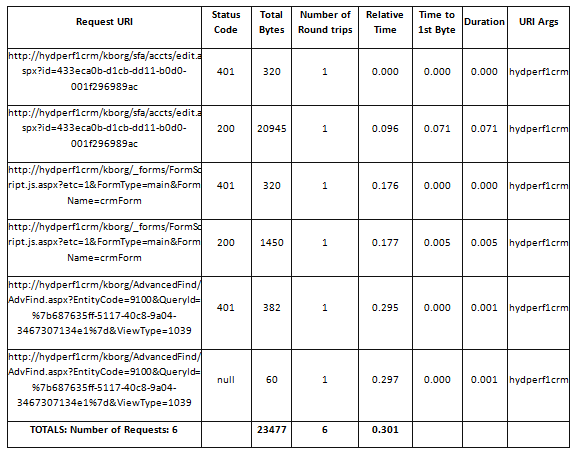 Download VRTA (Visual Round Trip Analyzer) from http://www.microsoft.com/DOWNLOADS/details.aspx?familyid=119F3477-DCED-41E3-A0E7-D8B5CAE893A3&displaylang=en and install in the machine where you have installed CRM Performance toolkit. 3. Install the appropriate version of Windows Support tools in the machine where you have installed CRM Performance toolkit. The NetCap tool will be available as part of this installation. 5. Replace the BandWidthUtilities class in <ToolkitInstallRoot>\CRM4_Perf_Toolkit\CRM_Perf_Benchmark\Utilities\Util.cs with the below code. 6. The function ‘RunNetMonExpert’ assumes that VRTA is installed in the default location (under local app data \Microsoft\VRTA). If VRTA is installed in some other directory, modify the function to point to the actual VRTA executable directory. Test Bandwidth capture: Now we are all set to test bandwidth utilization, while running a web test or a load test. Make sure that ‘bandwidthcapture’ node in ConfigSettings.xml under <ToolkitInstallRoot>\ConfigFiles has <bandwidthcapture value=”true”> and then run any web test or load test. You will see that inside ‘bandwidthoutputdir’ (set in ConfigSettings.xml in step 4); three files are created per transaction in the web tests. There is one .cap file which contains the raw capture data. You can use NetMon or VRTA to analyze this. Also, there will be one .txt file generated by VRTA which records the web requests with all the parameters. The third file is an .html file and the most convenient of all these. 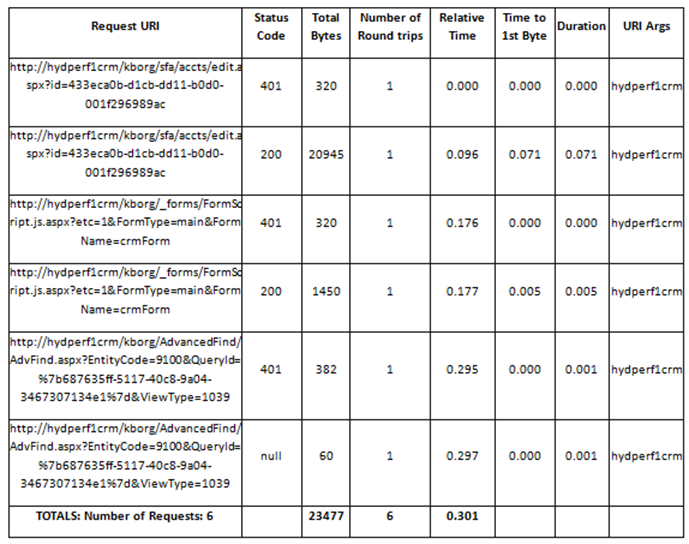 This file records all the key parameters for all the web requests and also keeps a link to the .cap and the .txt file in case you want to open them after seeing this consolidated report. You can add/remove parameters to be recorded in this file by modifying the ‘ParseRTAFile’ function in the above mentioned code. If you want to capture the ‘warm’ state (static requests are cached) bandwidth result, then set <parsedependentrequests value=”true”/> node in ConfigSettings.xml file whereas if you wish to capture the ‘cold’ state (every time static requests are sent to the server) bandwidth result, set this node value to “false”. Conclusion: With the help of NetMon, NetCap, VRTA and minor modification in CRM Performance toolkit, we can easily perform bandwidth utilization testing for tests present in CRM Performance toolkit. Though the existing web tests provide a pretty good coverage, you can create additional tests according to the need of your bandwidth test suite.